30 year-old male with no significant PMH presenting with right-sided “weakness”, vertigo and headache for three days. The patient was in his normal state of good health until three days prior to admission when he was out shopping and felt a headache and right-sided weakness. The headache came on suddenly, felt “sharp”, 7/10 in severity and radiated from the posterior occiput to his forehead on the right side. The headache was associated with vertigo and nausea/vomiting. At the same time, the patient noticed that he was no longer able to walk, describing “weakness” on the right side. He also began feeling dizzy, describing the sensation as “room spinning”. He denied changes in vision, hearing, difficulty speaking or swallowing (though he has had persistent hiccups for the past few days). He also denied CP, palpitations, SOB. He did seek immediate medical attention at an OSH but is unable to recall what was done and he was discharged from the ER on the same day. He presents 3 days later with persistent symptoms. Gait: wide-based, unable to tandem, heel, toe walk. Walking in place, he turns to the right. 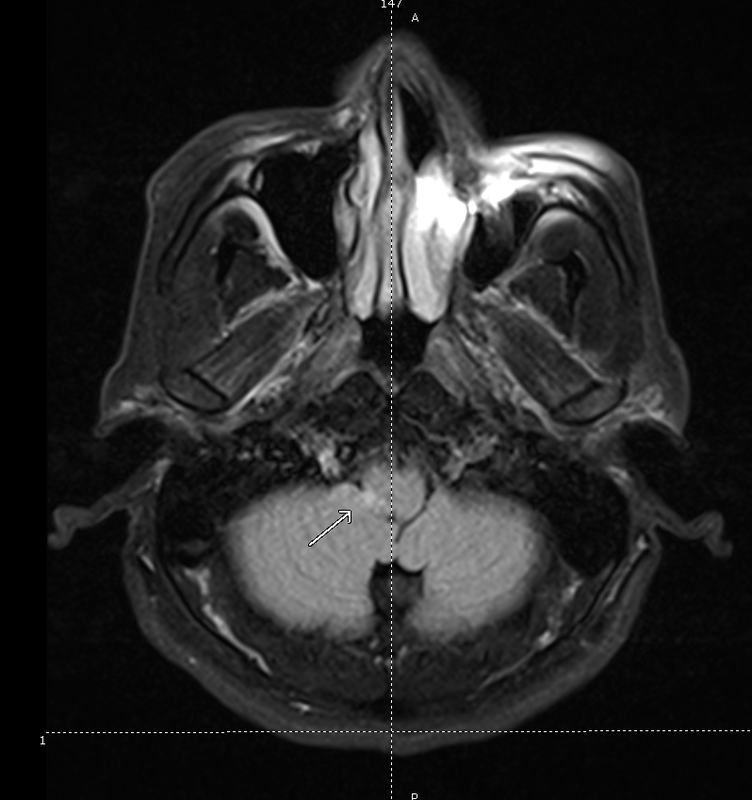 30 year-old male with no PMH presenting with 3 days of HA, vertigo, hiccups, right-sided ataxia, and alternating decreased pain and temperature sensation on ipsilateral face and contralateral hemibody. These symptoms are suggestive of a brainstem lesion, localizing to the medulla. Hiccups suggest involvement of nucleus ambiguus (CN IX, X, XII). Alternating decreased pain/temperature sensation suggests involvement of the spinal tract of CN V, and interruption of fibers of the descending spinothalamic tract. These findings point further to a lesion in the right lateral medulla, likely vascular given the rapid onset of symptoms. Associated findings of right-sided ataxia suggests involvement of the superior cerebellar peduncle (restiform body) in the posterior lateral medulla. An MRI brain showed the lesion shown in Fig-1, and a CTA head/neck the following day showed dissection of the right vertebral artery. Strokes are characterized by the sudden onset of focal neurological deficits. These are typically unilateral and consciousness is generally maintained. If some of these typical features are not present (ex. gradual onset, significantly impaired consciousness, seizures early), consider alternative diagnoses (ex. hypoglycemia, subdural hematoma, mass, postictal paresis, migraine). Agabegi, S. (2013). Step-up to medicine. Philadelphia: Wolters Kluwer/Lippincott Williams & Wilkins.